Ceph is a unified, distributed storage system designed for excellent performance, reliability and scalability. The power of Ceph can transform your organization's IT infrastructure and your ability to manage vast amounts of data. Founded in 1982, Connection delivers advanced technology solutions and IT services to business, government, education, and healthcare markets. With over 2500 technical certifications they can help provide solutions to the simplest and most complex IT problems alike. When A-B was formed in 1997 it was a woman-owned small business with two full time employees. It has since expanded, now with many employees providing customers technology solutions, maintenance, network integration services, sales and consulting services. A supplier of technology solutions for business, government, educational institutions, and customers, PCM provide access to more than 300 000 IT products from Laptops to servers and offer eProcurement tools, comprehensive software licensing solutions and dedicated account executives. Red Hat enables collaboration with its industry leading open source software. They are the world's leading provider of enterprise open source solutions, using a community-powered approach to deliver high-preforming Linux, cloud, container, and Kubernetes technologies. Gluster is a free and open source software scalable network filesystem. Using common off-the-shelf hardware, you can create large, distributed storage solutions for media streaming, data analysis, and other data- and bandwidth-intensive tasks. The makers of the most versatile and dependable high-capacity hard drives available. Seagate is the one of the most popular brands with consumers and enterprises alike, due to their excellent quality and service. Western Digital brand is a leading global data storage brand that empowers people to create, manage, experience and preserve digital content on a range of devices. They address a range of customers through their strong portfolio of trusted product brands. A certified small business, providing the public and private sectors with current and emerging technology solutions. Madison Cloud provides a range of cloud services to help organizations optimize current infrastructures while leveraging cloud technologies to align with future mission objectives. Founded in 2004, Betis Direct is a 100% US, minority owned small business that provides IT solutions to a wide range of customers. They empower their clients to meet their business needs through the wholesale distribution of computers, peripheral components, and software. Custom Electronic Enclosures, sheet metal parts and CNC machining with no minimum orders and built in two to three days. 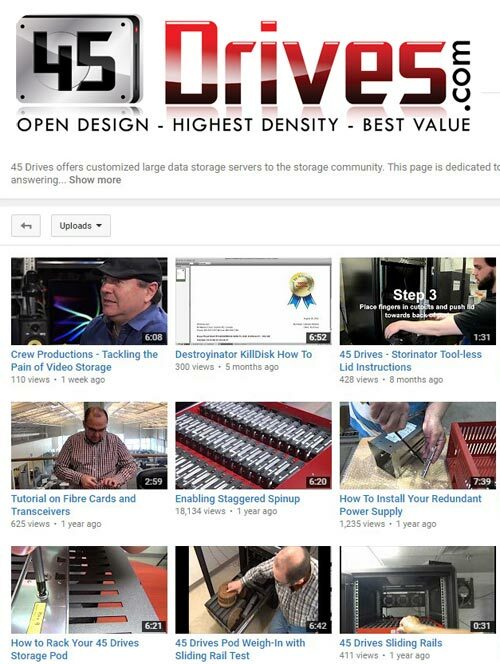 45 Drives is a division of Protocase Incorporated and Protocase manufactures all of our server chassis. Blue street capital focuses on pairing technology solutions providers with growing businesses. Their skilled team of financial experts provide flexible, customized, and inventive payment options designed to work around the needs of growing businesses. HP Financial Services provides flexible investment solutions to provide the capital required for innovation to growing technology companies. They make customized strategies for your business, with the expertise to fine tune your plans as your company evolves. A storage platform for production, distribution & collaboration. Caringo's flagship product, Swarm, decouples data from applications and hardware providing a foundation for continued data access and analysis that continuously evolves while guaranteeing data integrity. They provide application-optimized server, workstation, blade, storage, and GPU systems. With over $2 billion in revenues and 5x growth in 6 years, Supermicro is ranked as the #1 fastest growing IT company in the world and #18 fastest growing company overall by Fortune Magazine. Founded in 1983, Zippy Technology Corp. was known for its micro switch technology. Zippy has now grown into a company with professional R&D teams and high quality manufacturing processes and are known for a broader range of computer hardware. The world's leading manufacturer of processers, they are at the forefront of technological innovation. Intel invents at the boundaries of technology to make amazing experiences possible for business and society, and for every person on earth. Ubuntu is an open source software operating system that runs from the desktop, to the cloud, to all your internet connected things. Fast, secure and simple, Ubuntu powers millions of PCs worldwide. Debian is a free computer operating system composed entirely of free software. It is produced by almost a thousand active developers spread around the world who volunteer in their spare time. Unraid lets you partition system resources to store and protect data, run any application, and/or create virtual machines in isolated environments. It empowers you to build the system you've always wanted using your preferred hardware, software, and operating systems.